Using money from anglers' rod licences, the EA is working to kick-start recovery of a 16 mile length devastated by a major pollution last summer. The river's fish and invertebrate life were pretty much wiped out all the way down to Thornborough in the days following a Brackley factory fire. The EA plan involves some 8,000 chub – plus 8,000 roach and 8,000 dace – from the agency's Calverton fish farm being added each year for five years. The ambition is that, with the food chain starting to recover, the incoming fish (up to four ounces) will grow and breed to produce stock levels expected of a healthy river. Experts are still examining the pollution's causes, work which may yet result in a prosecution and or claims for restoration costs. THIS week EA was due to add several thousand small, farm-bred, barbel to the Ouse around Odell, and to the lower Ivel, in areas where they are thought most likely to survive and breed. 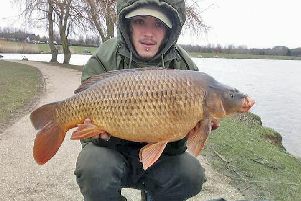 PHIL Mapp is the man to back to catch good fish in the Ouse whatever the weather. And two outings this weekend saw him extract just over 6lb of rocking horse droppings masquerading as a local Ouse barbel, and a 6lb chub, from the floodwater. AARON Henderson had a nice double figure pike from the local canal. OLNEY Ouse open: Mick Burrell 9-3 (perch to 2-13), Jim Martin 2-15-8 (one perch) Sam Corteze 2-14. TOWCESTER/Nene, Ouse, Stony Main: Les Wallace 6-14 (perch to 2lb), Harry Harris 3lb, Dave Gibbins 2-6. IAN Mills topped Wellingborough's Foxton canal league second round with 5-9-7 of roach as his MK team finished second on day and took the series lead. 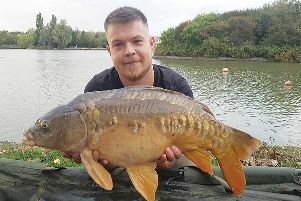 PIKE match, Newport's Big Pit: Patryk Graba two for 10lb, Ray House 9-12, Alan Percival 8-2. MK Vets, canal, Giffard Park: Paul Hamilton 5-14 (perch), Mick Hefferon, Rob Gibson and Del Rowland 1-2 each. TOWCESTER Vets, canal, Grafton Regis: Les Goodridge 1-8, Brian Ayliffe 1-6, Paul Minney 0-15. SATURDAY's 'Evening with Des Taylor' at Waters Edge attracted 60 people, and another is planned for November. FIXTURES: Saturday evening, Newport AGM, town WMC; Sunday, MK Individual winter league/golden peg, 01234 713144; Tuesday and Feb 23, Olney Ouse opens, 01234 240061.